"I strive to tell the whole story. It is capturing the essence of a moment or a series of moments through still and moving images and fusing them together to create a complete picture. It is an art. It is my passion." It is the simple joys and the grand events that make up our lives. This is our history. By capturing these moments we are able to remember the scope of our lives, share them with our loved ones, and pass them on to the future. 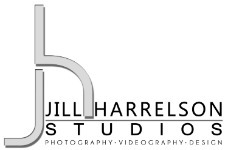 Jill Harrelson Studios brings together all of the elements in capturing your story. Through photography, videography and design, Jill and her staff bring to light the details that might otherwise go unseen. They work with you to be your unique self, to be real in your pictures, resulting in memories that are forever treasured and preserved.